Today is Bobby Brown’s 46th birthday. A former member of New Edition, Brown had his first solo hit in 1988 with “Don’t Be Cruel,” which reached #8 on the Hot 100. 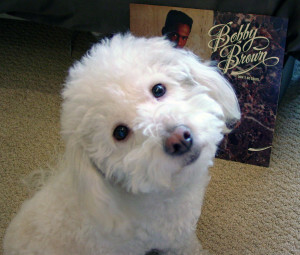 Though it shares its title with an Elvis Presley #1 hit from 1956, Brown’s “Don’t Be Cruel” is not a remake. That brings us to today’s playlist, which I call The Song Retains the Name. It consists of different songs with the same title. I initially planned to include twenty such songs, but more kept springing to mind. Before I knew it, I passed 100 entries. There are plenty more, so I decided to open this up to my reader(s). If you have songs that share titles you’d like to add, feel free to do so. (NOTES: I included The Jacksons’ “This Place Hotel” because when it was released in 1980 its title was “Heartbreak Hotel.” Thought he didn’t have to, Michael Jackson, the song’s writer, later changed its name to “This Place Hotel” to avoid confusion with the Elvis Presley song “Heartbreak Hotel.” Whitney Houston didn’t feel the need to make the same Hotel accommodation. Click here to follow Tunes du Jour on Facebook!